When’s the last time you checked your financial health? Do you know if you’re heading down a path to financial trouble? It’s easy to get caught up in the day-to-day grind and forget to look at your finances until it’s too late. Sometimes, in that grind, you build up bad habits that put your financial health at risk. The problem is when these habits become normal and you don’t see that they’re bad habits anymore. It happens all the time! You get into routines and create habits that aren’t helping you but you keep doing it because it’s easy and has become your new norm. That’s when things get dangerous. 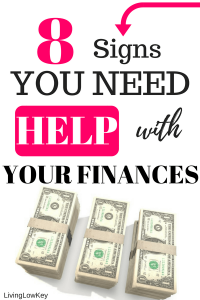 You may have all these red flags warning you that you’re in financial trouble but you don’t even see them. Other people might see the issues but talking about money has become so taboo that nobody wants to step in. Not us, we’re here to let you know that you’re in financial trouble. You might not see the warning signs so we’re going to lay it out for you. It’s up to you to take an honest look at yourself and ask if you have any of these red flags. You’re probably thinking “oh, I won’t have any of these red flags, I’m doing fine with my money.” But how do you know unless someone points them out? It’s much better to check your financial situation than to continue down the path you’re going if you’re heading into financial trouble. Heck, you might read through all these signs and not see any that relate to you. If that’s the case that’s great!! Just keep in mind, this isn’t an all-encompassing list. There are plenty of other ways to get yourself into financial trouble so I recommend that you do an annual self-check to make sure you’re on the right path. For me, when I hear that you don’t have an emergency fund it’s not a matter of IF you’re going to be in financial trouble, it’s WHEN. I can’t stress enough just how important it is for you to have an emergency fund. To protect yourself from life’s unexpected moments, you’re going to want that money set aside. What’s going to happen when your car breaks down or you get sick and have to go to the doctor? You’re going to end up paying those bills with a credit card or taking out a small loan and that’s a quick way to get in a bad spot financially. We have a 5-month emergency fund set up but we didn’t get there overnight. We started by creating a $1000 emergency fund and slowly built it up. That’s where I want you to start, just aim to save $1,000 as a starter emergency fund. You’ll be surprised how much stress is lifted off your shoulders once you have an emergency fund. How To Build Your Emergency Fund: This weekend I want you to find a big jar. On Monday, put $1 in that jar. On Tuesday, add $2 to the jar and then $3 on Thursday. Continue that trend until Saturday when you put $6 in the jar. On the following Monday, repeat the process all over again for an entire year. This comes out to be $21 per week added to the jar. If you do that for all 52 weeks of the next year you’ll end up with just over $1000 in your jar. THAT’S HOW YOU BUILD A $1,000 EMERGENCY FUND!!! We’ve all heard of the phrase, keeping up with the Joneses. You know what it is, buying things you don’t need just because your neighbor or friend got a new toy. It’s all about keeping up the appearance that you have a more lavish life than you really do. Is it worth it? Is spending more money than you have and putting your retirement at risk worth it just to keep up appearances?? I think not. So stop doing it!! Stop keeping up with the Joneses, because guess what, they’re broke! I know it’s tempting to upgrade your phone every two years or get the latest big screen TV. What about cars, people love to get a new car when their current one is only a few years old. These are the trends that you have to stop now. If you find yourself trying to keep up with the Joneses, STOP IT NOW!! Trust me, in 20 years when the Joneses are still sitting under a mountain of debt, you’re going to be living it up in early retirement because you chose to live a more frugal lifestyle! How To Fix This Bad Money Habit: In order to fix this bad money habit and avoid financial ruin, you need to implement a budget. I suggest the Cash Envelope System style of budgeting because it will keep you from spending more money than you have. We used the cash envelope budgeting system to save over $100,000 in 5 years! Trust me, the system works if you stick with it! The hardest part is going to be changing your mindset from being a consumer to being more frugal. If you need help with being more frugal, check out our list of 50 Frugal Living Ideas. For all around finance help, check out our eBook, Frugal Finances: The Keys to Unlocking Financial Freedom. 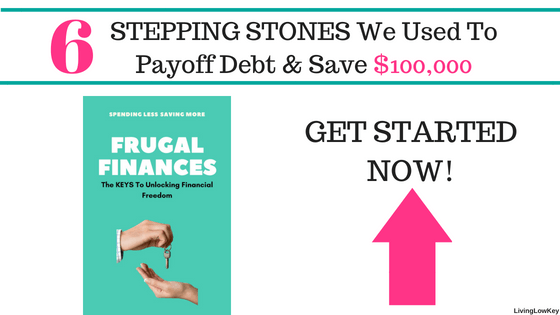 The eBook will give you the groundwork you need in budgeting, paying off debt, and money saving ideas that will lead you down the road to financial freedom. Have you ever missed a payment on a bill? Do you miss payments frequently? Missing a payment or making late payments is a sure fire way to get yourself into financial trouble. Not only will the bill collectors be calling to get the money, a lot of times you’ll be hit with late fees and you end up paying even more. There is a hidden side to missing payments or making late payments that you might not even think about, it hurts your credit score! That’s right if you consistently miss payments or make late payments, it knocks down your credit score. If you’re ever in need of a loan or are applying for a credit card, you are going to want a good credit score. Don’t let something as simple as a monthly payment being made late, ruin your chances at buying your first house or taking out a loan for a car. Now that you’re thinking about your credit score, here are a few other bad money habits that can affect your credit score. Never Miss A Payment Again: In order to make sure you never miss a payment again, we need to first get you organized. In our Free Budget Binder there’s a sheet for a Monthly Bill Tracker. I want you to download the FREE Budget Binder located here and start using it today. That Monthly Bill Tracker is going to be key to you never missing a payment again. Once you’ve got the tracker, write down all your bills and the due dates for them. Think about everything you pay for each month, you don’t want to forget anything. With all your monthly bills and their due dates written down, it’s time to do a quick check. Are there any bills you can set up to make automatic payments? We love using automatic payments so we don’t have to worry about paying bills. Now that we’ve scrubbed your list of bills, hang that Monthly Expense Tracker up somewhere you will see it every day. I recommend hanging it on the fridge. Get yourself a little calendar and write down the bills on the days they are due each month. We use this method. You can see the calendar we’re using this year below. We love this calendar because it has some of our favorite beaches in the Caribbean and who doesn’t want to see those beaches every day!! Do you have a credit card that you’re using to pay monthly bills?? If you’re thinking that it’s an okay thing to be doing, you are dead wrong!! Let’s put it this way, you’re creating debt to pay off debt so nothing changes. You’re actually in a worse financial position now because those credit card interest rates are ridiculous! I know that sometimes emergencies happen, but that’s why it’s important to have an emergency fund! Stop paying your bills with a credit card right now!! No more, don’t do it!! If you need some extra cash, pick up a side hustle. You’re really putting yourself into a risky financial situation by using credit cards to pay bills. Ditch The Credit Card, Pay With Cash: I want you to start paying your bills with cash you have, you’re going to forget all about using those credit cards for bills. The most important thing you can do to break this bad habit is to create a budget! If you don’t have a budget already, you need to get that started today!! Budgeting is what made it possible for us to save $100,000 in 5 years and also helped us buy our first house! Creating a budget is also what’s going to help you get away from paying bills with credit cards. If you need help setting up your budget, check out our FREE budgeting course here. This budgeting course will show you the exact steps we take to set up our budget each month. If I were to ask you how much money you spent last month, would you be able to tell me? Can you tell me if you’re spending more money than you make? These are important questions that you should be able to answer. If you’re not able to answer those questions then you’re setting yourself down a path towards financial trouble. It’s extremely important that you know how much money you’re spending each month. That’s the only way you’re going to be able to get your spending under control. You have to know where your money is going if you want to take back control of your finances. There was a time in our lives where we weren’t tracking our spending. It still blows my mind that we could have ever been that careless with our money. When we finally started budgeting, we realized we were spending more than we made in the month. It was eye opening and made us focus on our finances a whole lot more. How To Track Your Spending: You’re going to fix this problem right now, it’s time to start tracking your expenses!! I told you about our Budget Binder earlier. If you only want the Monthly Expense Tracker that comes in the Budget Binder, you can get that for FREE by filling out the form below and it will be sent directly to your inbox. There are other ways to track your spending. I’ve used excel spreadsheets in the past because they’re simple and you can set them up to do the calculations for you. One of our banks, that we don’t use very often, has this really cool online tool that tracks your spending. Whenever you purchase something using their check card, it automatically groups that into a category. At the end of the month, we could look and see what categories we spend the most on. Check with your bank to see if it has anything like that. The last and most simple way to track your spending each month is to just simply write down what you spend and add it up at the end of the month. To give yourself a quick check on your financial situation, subtract your monthly expense from your monthly income. If that number is negative, you overspent that month and need to cut back on your spending. One of the biggest signs your heading towards financial problems is if you’re borrowing money from retirement accounts to pay bills. If you’re dipping into your 401K or mutual funds, you need to stop that now. There are several reasons you could be put into the situation where you have to take from retirement accounts, but you need to avoid it at all costs. Pick up a second job or sell things you don’t use to make extra money. When you’re dipping into retirement accounts you’re literally putting your retirement at risk! You have to think about things long term. I know you might think you have a lot of time to make up the money you pull out of your 401K, but you have to remember how important compounding interest is. You’ll be losing valuable interest during the time it takes you to repay what you took out. How To Stop Borrowing Money: The first thing you can do to quit this bad habit is by building an emergency fund. That emergency fund is going to protect you from having to pull money out of your retirement accounts. When our A/C unit died, do you think we pulled money out of our mutual funds to fix it? Heck no!!! We’ve spent years building up a solid emergency fund so we paid cash to fix that A/C and didn’t even sweat it… That’s why having an emergency fund is so crucial! Another way to kick this bad habit is to simply tell yourself that retirement accounts are off limits. This will require some dedication and focus from you to make it happen. If you make a mental note that those accounts are untouchable you’ll be less likely to dip into them. We just talked about dipping into retirement accounts to pay bills. That gets really hard to do if you don’t even have a retirement account. If your retirement plan is winning the lottery, you need to come up with a new plan ASAP!! Did you know that your odds of winning the Powerball lottery are 1 in 292,000,000!!! That’s terrible odds. Your odds of being struck by lightning once in your lifetime are 1 in 3,000. You literally have an exponentially better chance of being struck by lightning than winning the Powerball lottery. Now that you know your odds of winning the lottery, why are you using that as your retirement plan? Better yet, why are you even playing the lottery?? Take that money you’ve been wasting on lottery tickets and put it towards a real retirement plan. Your 65-year-old self will thank you! Are you and your spouse or significant other discussing your finances? If you’re not, that’s a really big red flag that you could be in financial trouble or at least be heading for it. We discuss our finances a lot. Over the years we’ve become very comfortable talking about money/finances and now it just happens easily. We even make it a competition to see who will have the better credit score when we check each year. I’m not just going to sit here and tell you that you should be having money talks, I want you to know the reason why. First, if you aren’t married yet, you’ll want to know where your partner stands financially but you’ll also want them to know what your financial situation is. Money is a top reason that couples fight. You don’t want to be surprised by financial baggage and you don’t want to surprise the other person either. This is the first step to getting comfortable talking about money. Another reason that you want to talk about money with your spouse is that you want to make sure you’re both have the same goals in mind! What good is saving money if you’re both saving money for different reasons? You need to align your goals and tackle them together! How To Open Up About Your Finances: It’s not going to be easy at first but you have to talk about finances. If you’re in a serious relationship or married, you need to have this talk sooner rather than later. Here is my suggestion for how to approach it. Create an agenda together. Instead of talking about your finances directly, create a list of questions that you want each other to answer. Work on these lists together. 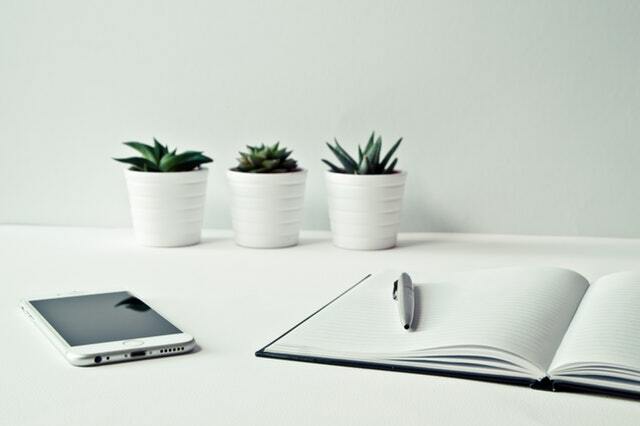 Once your list is created, take some time to yourself answer the questions by writing it down. Once you’ve answered all the questions, it’s time to meet with your partner and start the discussion. I think you’ll find the conversation much easier if you have talking points already laid out. What kind of debt do you carry? How much do your monthly bills add up to? How much can we spend before consulting each other? These are just a small sample of the questions you should be asking and the topics you should be talking about. The point of all this is to make sure that you and your spouse or significant other are openly talking about your finances. Surprises can be fun, finding out you are in financial trouble like you just walked into a surprise party is not. 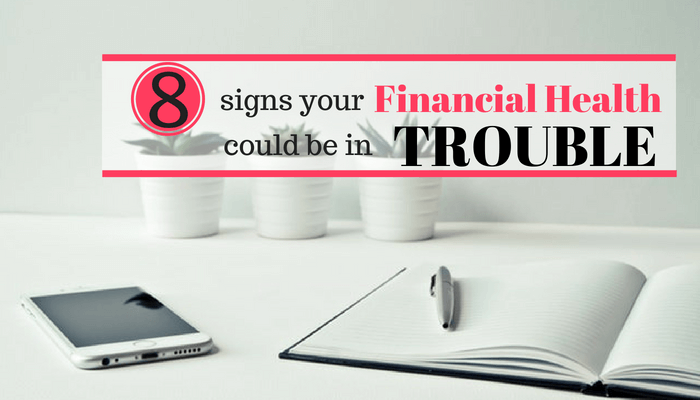 There you have it, 8 signs your heading for financial trouble. It’s extremely important that you know these are not the only signs. Make sure you regularly check your financial health and take control of your finances. How Do You Check Your Financial Health? ?